Britain's royal family announced new guidelines Monday for its social media channels after reports of online abuse around Duchesses Kate and Meghan . The new guidelines issued by Buckingham Palace, Clarence House and Kensington Palace say the palaces reserve the right to block users and send comments that breach the guidelines to the police. "We ask that anyone engaging with our social media channels shows courtesy, kindness and respect for all other members of our social media communities," read a statement issued Monday. The proactive step by the royals comes just a few weeks after Hello! magazine reported that Kensington Palace aides devote hours each week to moderating and deleting violent, sexist and racist comments on social media directed at Kate, the wife of Prince William, and Meghan, the wife of Prince Harry. 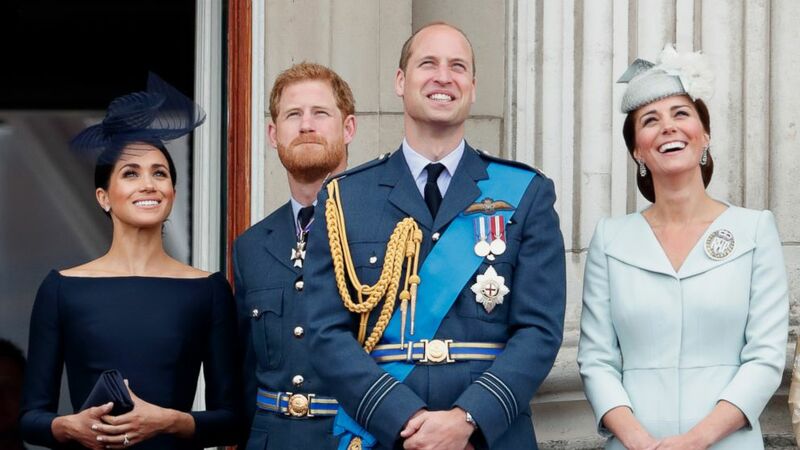 (Max Mumby/Indigo/Getty Images) Meghan, Duchess of Sussex, Prince Harry, Duke of Sussex, Prince William, Duke of Cambridge and Catherine, Duchess of Cambridge watch a flypast to mark the centenary of the Royal Air Force from the balcony of Buckingham Palace, July 10, 2018, in London. The British media circulated reports earlier this year about rumored rivalries between the two royal wives and difficulties Meghan is facing as she adjusts to her new life as a member of England's royal family. "The palace has been talking to Instagram and they are working on ways to improve the situation," the magazine's royal correspondent, Emily Nash, told "Good Morning America” in January. "I've been told that police have been involved in a couple of situations." The online bullying is directed not only at Meghan and Kate as fans seem to take sides, but also between fans who go after each other in the comments, according to Nash. 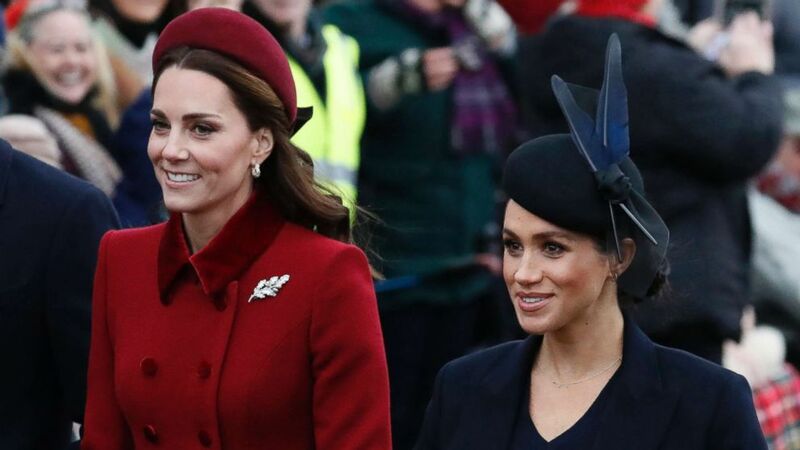 (Frank Augstein/AP, FILE) Britain's Kate, Duchess of Cambridge, left, and Meghan, Duchess of Sussex arrive to attend the Christmas day service at St Mary Magdalene Church in Sandringham in Norfolk, England in this Dec. 25, 2018 file photo. "A lot of it is very petty -- a lot of body shaming and criticizing how they walk, how they look -- and a lot of this is coming from women," she said in January of the criticisms directed at the royals. "Meghan is a newcomer so there is a lot more scrutiny on her." Duchess of York Sarah Ferguson, the ex-wife of Prince Andrew, weighed in last month on what she called the "sewer" of social media, comparing the online bullying to what the media did with her and Princess Diana. "Women, in particular, are constantly pitted against and compared with each other in a way that reminds me of how people tried to portray Diana and me all the time as rivals, which is something neither of us ever really felt," she wrote in a candid letter published in Hello!. The royal family's new guidelines say that social media comments must not "contain spam, be defamatory of any person, deceive others, be obscene, offensive, threatening, abusive, hateful, inflammatory or promote sexually explicit material or violence." The palaces -- which have millions of followers across multiple social media accounts -- reserve the right to "determine, at our discretion, whether contributions to our social media channels breach our guidelines," according to the statement.